Hello, welcome back. First of all please see the URGENT! note further down at 14.1, because it would be a pity to miss the webinar if it might interest you. Now, to our normal affairs. As promised in the last Mid January Bulletin 69 on Cost Reduction (See PWL#101B) this Issue 102 of Practical Welding Letter opens with the most interesting and important article of my friend and mentor Naddir M. Patel on Process Optimization and Innovation. It is important because it touches on the pockets of most industries involved in welding, by showing that substantial gains may be obtained by looking for wastes and eliminating them. The author knows what he preaches, having worked practically at a number of projects with successful results. The article that follows shows the suggestions of an expert who explains how to establish squeeze time in resistance welding. This kind of practical advice should be always welcome. Then comes a report on development of brazing material for quite a particular brazing system, involving silicon carbide liners for nuclear plants. For most of us it is not our piece of cake, one should say, but anyhow... It is shown as a progress capable to stand the disastrous effects of accidents that plagued the Fukushima nuclear plant in Japan last year. It also demonstrates that a Research Institute with the vision of an urgent, practical, safe and economic solution is able to produce results by coordinating focused efforts. Innovation in welding is always welcome. Now it is about a new solid state process developed for welding aluminum and consisting in extruding filler material right into the joint. It should become competitive with Friction Stir Welding, at least for certain applications. This month the pages added to the website deal with two subjects. One, new, is about Power Sources for arc welding. The second one, completely rewritten, describes some common features of Welding Machines in general. Finding new, improved and less costly ways to manufacture large components to stand high pressures at elevated temperatures, is a continuous challenge for power generation industries. Now improvement of materials and equipment permit to reach the goals by using Powder Metallurgy and Hot Isostatic Pressing, but up to now these are not yet approved methods for the purpose. To overcome the last objections of the statutory authority (ASME) in charge of writing the rules (the Boiler and Pressure Vessel Code) a program was initiated to have them test and decide. The other sections can be found at their regular place. It is obvious that not all sections can be of interest to all of the readers. The point is to satisfy most of them. To be more responsive we would need to know what readers want. We introduced also a short Form for expressing satisfaction or complaints once you receive from us answers to your inquiries. You can find it in section 13. Let us know your preferences by using the Contact Us Form. We welcome your contributions, reflecting your unique knowledge and experience. Take the initiative, make your point, tell your opinion, write your piece. In this age of economic uncertainty and globalization, lowering manufacturing costs is critical not just for international competitiveness but also for the very survival of the operation. According to Export Development Canada’s (EDC) Chief Economist Peter Hall: "Managing through the upcoming slow months and a continued high dollar will require ingenuity and grit [...] Canada can expect even more intense competition." See EDC: Sorry! The link was removed by the Source. Process Optimization is the most cost effective solution to improving productivity. Implementation improves a company’s ability to lower operating costs and compete internationally. Six Sigma - which focuses on product (or service) accuracy by targeting variation in output. Both are data-driven approaches to problem resolution rather than personal opinions or beliefs. Lean targets the root cause of operational inefficiencies identifying and eliminating waste and in tandem with Six Sigma based statistical quality control protocols ensures the production of an error or defect free product. Lean - Six Sigma implementation is thus that silver bullet that can level the playground of global competitiveness. It is that force multiplier for Increasing Performance and Profitability that minimizes the effect of lower labor costs by significantly increasing the productivity of the work force. "Lean principles can generate significant benefits: faster response time, higher quality and creativity, lower costs, reduced drudgery and frustration and greater job satisfaction." [...] "Knowledge workers ... grossly underestimate the amount of inefficiency that could be eradicated from their jobs." "To remain competitive, companies essentially have to improve business performance. They have to create a focus on the bottom line. They have to reduce mistakes in every aspect of the company: product defects, incorrect billing, wasted materials and inefficient production processes. Six Sigma is a disciplined methodology that focuses on moving every process, product and service toward near-perfect quality." The example of GE, Ford, Tata and many others, validate that implementing Lean and Six Sigma is a proven driver to corporate profits. Implementing a Lean mindset also means accurately analyzing costs. "When a customer approached its aluminum casting supplier, a job shop near Chicago, with the "China price" in hand for a key part, the supplier made an unusual suggestion: Before relocating the work, let's do some "lean math" together. Increased warranty and scrap costs. Instead of re-sourcing, the customer pursued cost, quality, and lead time savings through extended value-stream mapping with its current supplier in Chicago". LEAN and SIX SIGMA protocols of Quality Assurance involve data collection and analysis. The root cause of any problem can be located and in effect solved. In the fabrication industry this is almost not done, with the emphasis being on Quality Control (QC) (code compliance), which by definition is resource draining. My own theory is that fabrication industry, by and large, considers welding as an art. Never mind that welding procedure specification (WPS) are rigorously documented. Till such time as the industry makes an effort to collect operational data, the value (resource) enhancing ability of Quality Assurance (QA) cannot be leveraged. Analyzing process data and identifying root causes for defects and deviations leads to implementation of corrective actions and fool-proofing of errors. Lean promotes efficiency by ensuring breakdown free production and targets operational waste through drastic reduction in repair or re-work. Six Sigma targets product (or service) variation by tracking process/product metrics. The goal is to reduce process or product variation (or process/product defects) to 3.4 (6 Sigma) spaced over a million operations. LEAN targets Waste as the enemy of any process. WASTES are losses like Delay, Repair, Rework, any value depleting operations such as unnecessary transportation and motion of material or people, waiting for information needed for a decision, etc., anything that affect costs and schedules. By identifying and eliminating waste, you can transform your company into a Leaner, and ultimately, a more profitable organization. Over production. E.g. Over re-inforcing the weld. Worse, welding a root pass too wide leads to the bead sagging in the overhead position. Waiting. Time delays or idle time between processes. E.g. completion of NDE; poor scheduling of filling passes. Transportation. Improper or unnecessary handling. E.g. Poor logistics planning leading to repeated moving welded cans and whatever other welded products or plates. Inventory. Holding or purchasing excessive material, or materials not meeting code or client specification. Motion. Non productive/non value adding operations such as Materials and tools needing to be located (poor housekeeping), located at a distance or for repair of defects. Over processing. Unnecessary processing steps that lead to producing scrap or parts that require rework. Ignoring innovation. Not using human resources optimally (not implementing the ideas / suggestions of employees). Not empowering/involving employees in optimization campaigns. SIX SIGMA involves SQC (Statistical Quality Control) and the following protocols. Define - the specific problem or improvement focus area. Measure - Data Collection of existing process. Analyze - Weaknesses, defects-process deviations and locate root causes. Improve -through data generated solutions Pareto-Ishikawa. Control - Fool proof the process. One does not need to invest in exotic and expensive statistical protocols and then invest some more in training to accrue benefits. Management simply needs to leverage their existing QA staff to go beyond form populating and into simple data collection and analysis duties as enumerated below. 1. Mapping (flow-charting) the process. Value Stream Maps will identify the process steps that are causing delays. Action can then be taken to remove the source of those delays. Spaghetti Diagrams will in turn identify and eliminate unnecessary movement of people or materials. 2. Control Charting to measure and monitor the performance of any process. 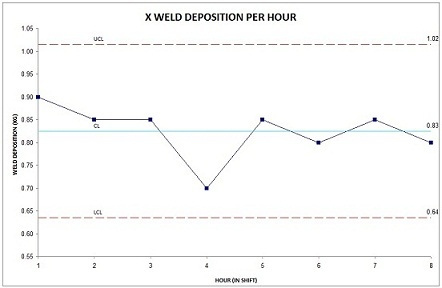 See the example of tracking weld deposition rates of various welders on a shift, as well as an individual welder through an 8 hour shift. (OF 11 WELDERS TRACKED THROUGH AN 8 HOUR SHIFT). This chart can then be used to identify and benchmark the best performance. Using the benchmarked performance of FIG.1, the individual control chart FIG.2 can now be tracked to locate reasons for performance deviation. Aside from time, factors such as current, arc distance, time to change the electrode, etc. can all be analyzed. Once tracked, the root causes of the bottle-necks in the process can now be targeted, using Pareto graphing, and Ishikawa (fish bone) diagrams. The example below, shows types of defects/discontinuities noticed during a standard vessel fabrication campaign. 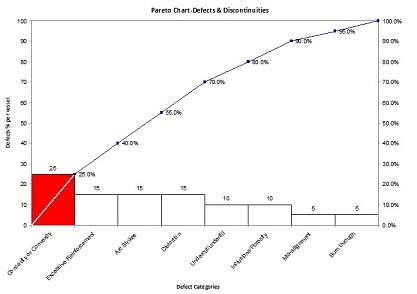 Causes that contribute to the defect or performance deviation can then be totalled and charted through a PARETO chart. FIG.3. PARETO OF WELDING DEFECTS/DISCONTINUITIES. This chart outlines where the effort on defect removal should be focused. This chart documents every possible cause for the defect and is, in effect, a solution generation mechanism. 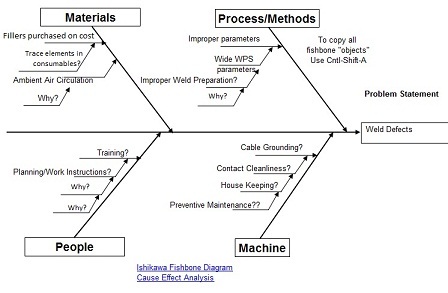 Process Variables can be demonstrated through a Fish bone or Ishikawa diagram focused on a problem statement. Following a protocol known as 5 Why’s, that is, asking "Why" 5 times for any problem occurrence; a foundation is laid for identifying the root causes of any problem. Once identified, an action plan can be put in place to fool-proof the process and prioritize corrective actions. 3. Matrix diagrams can then be generated to document proposed solutions. Once documented, work instructions and check-sheets, similar to ISO 3834 protocols can be generated. The welder now has a concise summary of what parameters will ensure not just adherence to code, but also an optimized, defect free performance. The process is now standardized and can be used to implement ISO if required. Spending time on grinding spatter, chipping slag, grinding welds down to final size or reworking/repairing parts, is a resource depleting effort. It slows production rates, reduces operational efficiencies dramatically and drains value from the project. Not tracking performance on the shop floor is equivalent to not tracking your personal finances or instruments. It is a recipe for disaster especially in competitive international environments. Get out of the rut of constant conflict with production, issuing warnings, NCR’s (Non Conformance Reports), basically conducting a janitorial clean up every time a code violation occurs. Take a leaf out of the project management groups' operational protocols. Chart out an action plan. Chart out a schedule. Begin with just a small amount of data and control chart it. Involve welders and supervisors in locating the root cause. You will generate a shop floor ally. Learn to collect and analyze process data, using very cost effective and uncomplicated software to expose the root cause. It is a statistical fact that over 95% of the problems can be attributed to the process, not to the individual. The documented results and the joint effort solutions will result in a reduction in repair and schedule delay, something that will be noticed and appreciated. Nothing shines like documented profit. Cost effective solutions are readily available to remove Defects, Deviations and Delays from your processes. You don’t have to spend huge amounts on consultants, expensive software or training and/or hiring statisticians to optimize your operations. You can leverage your existing QC personnel from their current position as statutory (code) requirement enforcers, which does not add value to the process. Instead of a regime of pass-fail, essentially pointing out a problem (non-conformance) after the fact, have them initiate a data collection and analysis drive. The root causes will be located and the process re-designed to eliminate the source of the defects or deviations. I am very grateful, also in name of this Readership, to Mr. Naddir M. Patel for his generous and timely Contribution. As the problems of Cost Reduction appear to be very important to the well being of Industries and Nations, I believe that due attention will be paid to his suggestions. Tracking, Reporting and Analyzing can be initiated instantly everywhere. It is quite probable that some positive results will be observed immediately. For those professionals not quite at ease with new ways of organizing work and using statistics, I would like to suggest that the helpful hand of the author is always available for overcoming difficulties. Please note that Raya Technical Services provides, among other kinds of professional assistance, also Process Optimization Services (on RFID deployment and Submerged Arc Welding too) through implementation of Lean and Six Sigma. Readers' feedback would be appreciated for gauging the impact of this article. Success stories would be most welcome as example and encouragement. This is not the first time I pick up useful hints from the always interesting Q&A notes published by The Welding Journal (January 2012, page 20). I always recommend these informative pages. An article published in the Advanced Materials and Process (AM&P) magazine of ASM International, (January 2012, page 24) describes a new approach to join silicon carbide ceramic matrix composites for fuel cladding of light water reactors. This application would displace current technology using zirconium alloy cladding, that melted because of loss of coolant accidents in last year disaster at the Fukushima nuclear power plant in Japan. The proposed structural ceramic material would not melt even at temperatures greater than 2000 0C and has high mechanical properties that recommend it for new nuclear programs. The development of a suitable brazing system was carried out at the Edison Welding Institute, (EWI), Columbus, Ohio. The joints service requirements are severe. Be radiation tolerant, sustain peaks greater than 1000°C, be stable to retain water, and be tough to withstand SiC swelling and vibration. Additionally, manufacturing problems must be addressed to produce thin gage fuel cladding. Brittle and/or high melting point materials may not be tough enough, or be difficult to manufacture. Existing brazing materials were found not suitable from the start. The patent pending technology developed by EWI might meet these requirements. It consists in a multiphase braze alloy interlayer consisting of silicon and aluminum with a two-phase joined microstructure. Preliminary tests show promising results. EWI uses of a hypereutectic mixture of aluminum and silicon. The initial interlayer is a two phase mixture of nearly pure silicon and aluminum with alloying elements. Heating the parts formed a microstructure consisting of plates of silicon with areas of aluminum rich silicon-containing phases with crack arresting paths imparting toughness to the joined assembly. In summary, the SiC-based fuel cladding is currently the most promising technology for enhanced accident tolerant nuclear fuels. Research is both important and urgent. The key problem yet to be solved is joining of the end plug to the fuel rod after fuel pellets are loaded. EWI developed a novel two-phase brazing approach that demonstrated a high probability for success. It does not require use of high pressures, a remarkable advantage compared to other processes. Future work will include stress modeling and mechanical and irradiation testing. Coextrusion Welding is a solid state process that heats to temperature and forces the workpieces together through an extrusion die. Exothermic Brazing is a process using heat from an exothermic chemical reaction between a metal oxide and a metal, to melt preplaced brazed filler metal in the joint. Joint Filler is a metal plate inserted in the joint members of dissimilar thickness. Local Prehating affects only a portion of a structure by locally applied heat. Nozzle Accumulation is a disturbing situation due to filler metal or surfacing material deposited on the inner surface and on the exit end of a nozzle. Oxygen Gouging is a thermal gouging process using an oxygen cutting variation to perform a gouging operation or to form a bevel. Peel test is a destructive testing method of a lap joined specimen, by peeling the elements with mechanical applied force. Welding Helmet is a welder protective device with a filter plate, to be worn on the head, to protect eyes, face and neck from arc radiation, heat, spatter expelled during welding or cutting. The January 2012 issue of The Welding Journal, reports on page 26 on a new solid state process used to weld aluminum alloys. The process, called Hybrid metal extrusion and Bonding (HYB), consists in a setup whereby a given filler metal is extruded by a special tool. The extruder provides a plastically deformed filler metal that is forced to flow under high pressure into the joint space between two aluminum plates. The oxide layers present on the joint walls are removed and displaced by the forceful deposition of the extruded filler. Complete metallic bond results from this solid state process. The innovation was conceived and realized at the Norwegian University of Science and Technology and presented during FABTECH, in Chicago, Ill., November 2011. By developing lower temperatures than Friction Stir Welding, as the mass involved in plastic deformation is only that of the filler, not of the base metal, the new process aims to perform solid-state joining without causing excessive HAZ strength loss. The article discusses the basic metallurgy of Al-Mg-Si alloys and describes the microstructure changes affecting the strength of the Heat Affected Zone (HAZ) generated by Friction Stir Welding. The process was developed in the laboratory, not yet in industrial applications, during the past four years, concentrating on a robust extruder design, process control and documentation of joint properties. The owners of the process believe that, by eliminating the need for the massive and costly equipment associated with FSW, they will be in a position to compete successfully with other solid state processes, in definite market segments. It will be interesting to follow the progress of successful uses of this innovative process to demanding industrial applications. Readers wishing to get the complete picture are urged to seek the original article indicated above. The Pages of this Month are a new one, dedicated to Power Sources for Electric Arc Welding, and a revised and completely rewritten one dealing with some characteristics of Welding Machines. The page on Power Sources describes in some detail the major types of this equipment, enhancing the remarkable progress due to electronic advancement. Not all kinds of welding need sophisticated equipment to perform correctly. Essential knowledge is needed not only for operating with success but also for procuring the right tool for the job. The process dictates generally the type of source better adapted to deliver the hoped for results, but also the materials to be welded and the positions may demand certain features. The rewritten page, available at EQUIPMENT deals with important arguments to consider when researching the equipment needed for given production programs. There are no known shortcuts. Adequate knowledge of the different types available and their suitability to the intended use are achieved with study and experience. All possible sources of information like manufacturers and development institutes should be tapped. Readers are invited to inform us of the subjects important to them. Use the Contact Us Form to let us know. 9.1 - Carburizing is a form of case hardening that produces a carbon gradient extending inward from the surface. It is performed in two stages. In the first, nascent carbon from a suitable carbonaceous material or atmoshere is absored and diffused on the surface of steel by heating to above austenitizing temperature. In the second stage the surface layer is hardened either by quenching directly from the carburizing temperature or by cooling to room temperature, then reaustenitizing and quenching. Tempering should follow as usual. 9.2 - Degreasing is any operation conducive to the removal of grease and oils from a surface. It is done using liquid organic solvent, either by immersion in the liquid, or by exposure to solvent vapors condensing on the parts being cleaned (vapor degreasing), or by spraying the parts with solvent. The soiled solvent can be distilled for reuse. Recent legislation prohibits methods polluting the atmosphere. See Vapor Degreasing. 9.3 - Forging means imparting a definite shape to mass of metallic material, usually heated to suitable temperature, by impact or pressure either between a hammer and an anvil (free forging)or within a die by the action of a punch (die forging). 9.4 - Lot is a specific amount of material produced at one time using well defined constituents, one process and constant conditions of manufacture. Also a quantity of material of uniform defined properties. 9.5 - Press Brake is an open-frame single-action press used to form, normally at room temperature, or to punch notches in sheet metal or plate. 9.6 - Ring Rolling is the process of shaping heated rings from pierced disks between power driven, shaped rolls, controlling wall thickness, ring diameter, height, and contour. How Do Pop-Up Timers Work? Progress in production of gas atomized powders for high quality alloy steels, stainless steels, and nickel-base alloy parts is at the base of innovative production routes for large components to be used in the power generation industry. Together with advancements in Hot Isostatic Pressing (HIP), larger size available facilities, and increased familiarity with the production of demanding components, these capabilities opened up opportunities to demonstrate the adequacy of Powder Metallurgy (PM)+(HIP) for manufacturing of high pressure retaining components. The advantages sought, relative to the regular manufacturing methods of casting, forging and/or welding, were Near Net Shape production, use of high quality gas-atomized powders, more cost effective solution for expensive alloys. Furthermore improved inspectability, reduced weight and machining, elimination of costly repair or rework, complete control on alloy composition, and drastic reduction of lead time of raw material supply were additional incentives worth being explored. However the regulatory authority, the American Society of Mechanical Engineers (ASME), through its binding document, the Boiler and Pressure Vessel Code, does not yet accept critical parts made by powder metallurgy. Therefore the Electric Power Research Institute (EPRI), together with four large companies, set out to promote a research and development program to demonstrate the capabilities of the new PM/HIP production method for use in the power generation industry, in view of obtaining the required approval. For the first material four heats of metals powders and three different products were selected and manufactured per ASTM Specification A988-07 (Standard Specification for Hot Isostatically-Pressed Stainless Steel flanges, fittings, valves, and parts for high temperature service). Mechanical properties were verified to exceed the minimum specification requirements. Toughness, grain size, density, porosity, microstructural uniformity and hardness were measured and demonstrated equivalent or superior to those of conventionally forged (and/or cast) stainless steel materials. The data package along with a DRAFT Code Case was submitted to ASME by one of the Consortium participants in November 2011. For the second material three heats were selected and mechanical properties were found to meet minimum requirements. Three parts were selected and were to be manufactured per ASTM Specification A989-07 (Standard Specification for Hot Isostatically-Pressed Alloy Steel flanges, fittings, valves, and parts for high temperature service). Additional results for the Grade 91 alloy and the parts for testing and approval are due to be submitted in the fourth quarter of 2012. The Code approval of PM/HIP manufacturing method for critical components in diversified industries will open up the adoption of highly reliable cost effective solutions. Interested readers are urged to see the original article from the Advanced Materials and Process (AM&P) magazine of ASM International, (January 2012, page 19). Thank you for your quick reply and your advice, [...]. As you may have surmised by now, one of my most painful frustrations is that, no matter how much thinking, research snd actual work may I have invested in providing my answers, there is almost never a follow up whatsoever. Therefore I came up with a short form asking inquirers to evaluate the Helpfulness (or lack of it) of my efforts. It may be modified following further experience. Readers willing to follow up on past advice received from us are welcome to do so by going to the Feedback page and by filling the short Form appearing there. Note: The Feedback page was discontinued long ago. will be held on Thursday, February 2, 2012, from 10-11 a.m. PST. Those wishing to participate should register on Miyachi Unitek's website. 14.7 - Click on the following image to watch the SBI! TV Show!